sister, Priyanka Gandhi Vadra, during her grand, carnival-like launch of her campaign in the narrow streets of Lucknow in BJP-ruled Uttar Pradesh. 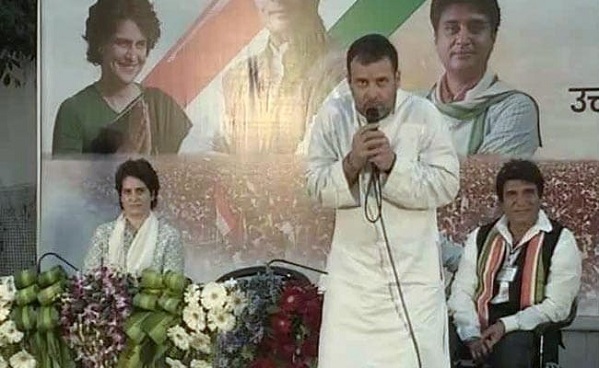 also Priyanka Gandhi, Raj Babbar and Jyotiraditya Scindia who sat behind the Congress president on the stage. loud cheers echoed all around the venue. from the stage, he said, “Today, Narendra Modi gives speeches like this.” The crowd roared at him. a swipe at Rahul Gandhi by pausing dramatically after a reference to “Shehzada”, and pretending to roll up both his sleeves during a rally in Chhattisgarh’s Raigarh. was seen as sending a message to the BJP. Priyanka is leading the Congress battle formation in eastern Uttar Pradesh, where the Lok Sabha constituency of PM Modi is located.